Naginata comes as one of several kinds of Japanese blades made as a pole weapon. As a weapon naginata was previously used by the samurais, foot soldiers (ashigaru) and warrior monks (sohei). As a variety of the spare, naginata is of the special concern that was popular among samurai class male and female warriors. Use of naginata as the martial arts weapon was a must for all Japanese women of the Edo period (1603 – 1868). Naginata was deemed as one of the considerable part of the young girls’ dowry. A naginata for females decorated richly (often called ko-naginata meaning a small naginata) was placed onto the worthy place in the samurai’s house. During civil periods naginata was mostly used by women from samurai class for the purpose to protect and guard their houses. Naginata consists of the haft of oval cut (it has the haft but not the shaft, as it seems at first sight) with the curved blade of a one-sided grind. The haft (nagaye or ebu) was about 120 cm to 240 cm long and the blade of around 25 to 30 cm. 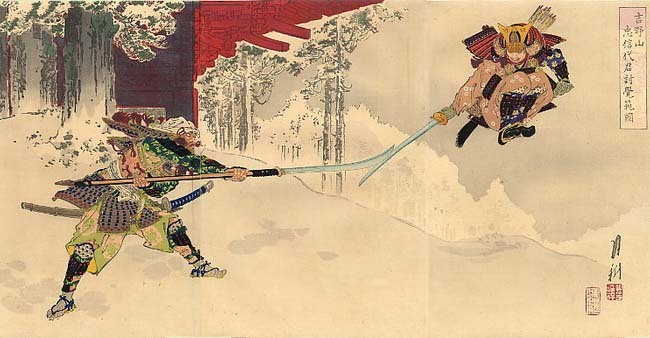 The naginata made for training purposes, light weighted and short-cut (about 1.2 to 1.5 m) became more popular with the time for its higher fighting efficiency. Previously naginata was the weapon used by the foot troops against the cavalry opponents. Monk-soldiers or Sohei always practiced with naginata as their basic weapon. Naginata-jutsu is the ancient martial art of naginata mastering in Japan. Naginata-jutsu is modernized today with competitions held between participants. It’s a little bit complicated to find out the root of naginata wielding precisely but the samurai class warriors supposedly fixed the blade to the longer haft with the purpose to extend the weapon radius and be ahead the enemy with the weapon ready. The art of naginata-jutsu was included in the training programme of many traditional martial art schools. This tradition is still kept in some schools thus far. Currently naginatajutsu is more practiced as the combat sports called naginata.